In a wedding ring warming or blessing your wedding rings are held by each of your guests who send you a wish, a prayer or a warm thought. By the time you exchange your wedding rings they come not only with your love for each other but with the love and warm wishes of all of your guests. 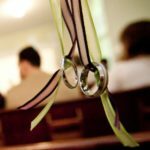 What do we need to plan for a ring warming or blessing ceremony? 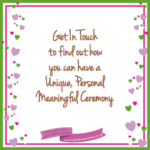 When you are planning your wedding ceremony decide with your officiant how and when you are going to give your guests the opportunity to take part. You also need to decide how your guests will know what is happening. This could be with a note on their invitation, a sign as guests arrive at the ceremony or by someone explaining it to them. You also need to decide whether the ring warming will happen before or during the ceremony and whether all or just some of your guests will be involved. If you want the rings to be passed in a special container that needs to be arranged in advance too. When does the ring warming happen? This could be before the ceremony starts with a ring warming usher or ring bearer standing next to the rings to explain what is happening. The wedding rings might be suspended on ribbons at the entrance to the Ceremony space. Or sitting in a dish or plate or tied to a ring pillow on a special table. You could have a sign which explains what your guests are being asked to do. Having the rings here can save time in a wedding with lots of guests. Alternatively you can have the rings passed around your guests whilst they are seated. This can be before the wedding party or the couple arrive at the ceremony or during the first part of the ceremony. It is best to have the rings tied together and passed on a plate or in a dish or on a ring pillow along the rows. It can be very useful to have ring ushers allocated to keep them moving along. If you have a very large wedding you may decide only to pass the rings along the front few rows or even the front row only where family are sitting. 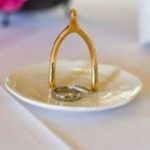 You may want the ring warming to happen whilst the ceremony proceeds or to have a piece of music play and focus on this as a special part of your Ceremony. 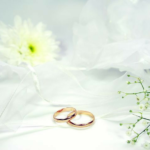 What matters most in a wedding ring warming ceremony? The most important thing is that the rings arrive with the wedding party at the front in time for the rings to be exchanged! 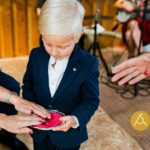 At a recent wedding the five year old ring bearer burst into tears at the responsibility he had been given of getting the rings to the best man at the end of the ring warming and had to be cajoled by one of the ring ushers to take them forward. One of those special moments. What words might be said if the rings are to be passed around?